Towards the end of the year 1807, Rev. 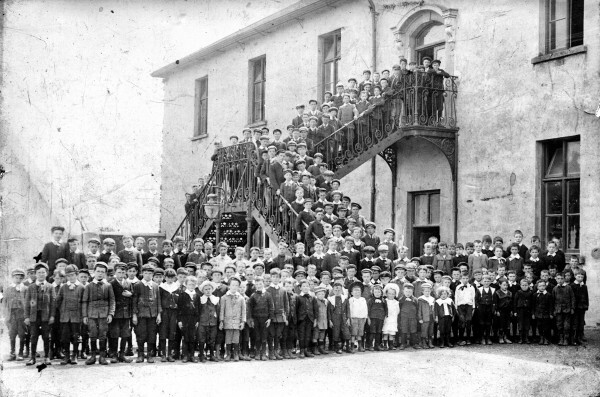 Brother John Mulcahy arrived in Dungarvan with the consent of the founder of the Irish Christian Brothers, Brother Edmund Ignatius Rice, for the purpose of establishing a school for the education of boys in the town. Soon after his arrival, he rented a store in Main Street in which he opened a school and Brother Mulcahy continued teaching there until 1811, when a convenient site for a school was obtained on the site of the present Park Hotel. A plaque on the front wall of the hotel commemorates this school site. In 1835 a new school was opened on the current site in Mitchell Street and in July of that year some 500 boys were admitted. A notable architectural feature of the school, the iron staircase, was built in 1897. The staircase has always been a focal point and the scene of many triumphant returns from playing fields all over Munster. It represents a magnificent background for many a photograph of jubilant boys and their mentors with their winning trophies. Up to the 1960s, the school building housed the primary children downstairs and the secondary school students upstairs. The increasing numbers of students attending the secondary school meant that requirements would soon outstrip the space available, so a decision was taken in 1963 to construct a new primary school in front of the existing building. This eight-classroom building was officially opened in March 1966 under principal Rev. Brother Murphy, and it serves the primary school education of boys in Dungarvan to this day. Due to a fall in vocations in the Christian Brothers, a permanent lay teacher, Mr. Maurice Kearney, was appointed as principal in 1990 for the first time in the history of the school. Notice was then given in December 1991 that the school was being handed over to the parish of Dungarvan and that CBS involvement in its management would cease. 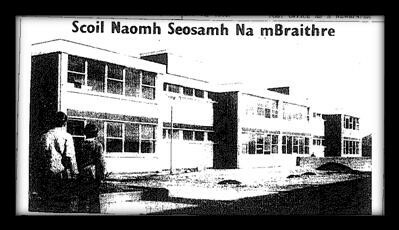 The handover took effect in May 1992 and the school was renamed St. Joseph’s (Scoil Naomh Seosamh). When Maurice Kearney retired in August 2013, Ms. Maeve Saunderson took over as the first female principal of the school. The uniform is a royal blue jersey, grey shirt and grey pants. 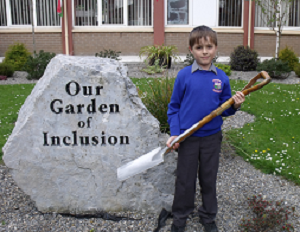 Our motto is “Ní neart go cur le chéile” and our crest depicts various activities within the school. Since 1966, many improvements have been carried out in the school, including conversion of a classroom to a Parents’ Room. Our Parents’ Room promotes among parents a sense of belonging to our school community, where parents are valued and work in partnership with the school. It is multi-purpose, providing a venue for courses, meetings, support programmes and relaxation. It provides a warm and welcoming forum for parents in realising their role as the primary educators of their children. The room was refurbished in 2008 and contains six computers and printer with internet access, a fitted kitchen with two cookers, and an information library for parents.